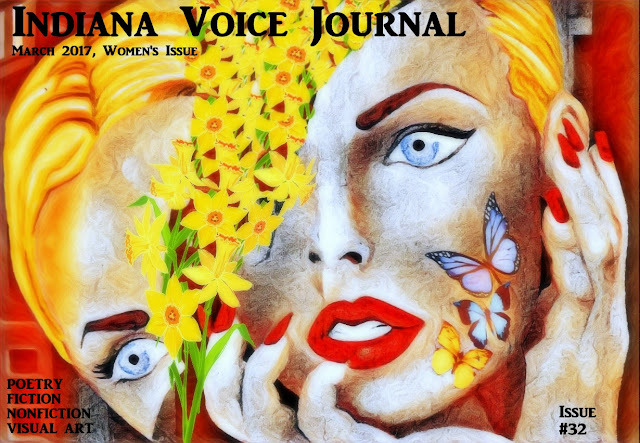 Powerful, historic, wacky, and wonderful...Welcome to the March 2017 edition of Indiana Voice Journal authored entirely by women! 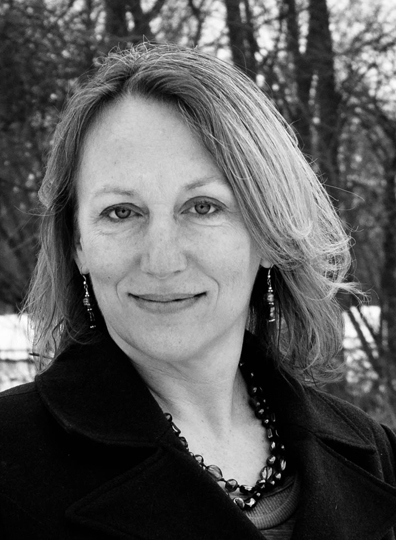 Three Poems by Marianne Szlyk: "Shattered, Callie Drives Through Nevada," "The Poet of Spotsylvania," and "Home from the Oncologist"
Four Poems by Laurie Kuntz: "Debussy at Dusk," "Hands," "A Basket Set on the Shore," and "Starfish and Suns"
Laurie Kuntz is an award-winning poet and film producer. She taught poetry in Japan, Thailand, and the Philippines. Currently, she is helping produce a documentary, Strangers to Peace, about the current Colombian peace process (www.strangerstopeace.com). Recently retired, she lives in an endless summer state of mind and drinks milk shakes and eats cake whenever possible. Three Poems by Anoucheka Gangabissoon: "I Saw Me, Did You?" "My Choice," and "The Contrasting Color"
Anoucheka Gangabissoon is from Mauritius, where she is a primary school educator. She says she “writes and publish as hobby and passion.” She has published a collection of poems titled “Awakened Fancies,: and has a nother collection pending with the Ministry of Arts of Mauritius. Her blog is at anoucheka.blogspot.com. She has been published in various literary journals, including SETU, Different Truths, Dissident Voice, and Tuck Magazine. Her works can also be found at poetrysoup.com. Three poems by Marcia Conover: "Mollie Mollie Mollie," "Forever," and "A Need to Cry"
Marcia Conover was born in Indiana, growing up in a small Farming community located in northern Madison County. Since she was a small child, she has had a compassion for animals in need and a love of photography and the outdoors. She wrote short fiction and poetry since high school and has been published in Indiana Voice Journal and several anthologies available on Amazon. She is married with 2 grown children and lives on a small farm where she has owned and operated an in home state licensed child care since 1984. Three Poems by Linda M.Crate: "i will only ever be me," "girls with ambition," and "i'd rather honesty than skeletons"
Linda M. Crate is a Pennsylvanian, native born in Pittsburgh yet raised in the rural town of Conneautville. Her poetry, short stories, articles, and reviews have been published in a myriad of magazines both online and in print. She has three published chapbooks: A Mermaid Crashing Into Dawn (Fowlpox Press - June 2013) and Less Than A Man (The Camel Saloon - January 2014), and If Tomorrow Never Comes (Scars Publications, August 2016). Her fantasy novel Blood & Magic was published in March 2015. The second novel of this series Dragons & Magic was published in October 2015. Her third novel Centaurs & Magic was published November 2016. Three Poems by Mary Winslow: "Driftwood Sculpture," "In Auden's Museum," and "Resurrecting Edith Gee"
Monique Hayes' poems and short fiction have appeared in Heart: Human Equity Through Art, Prick of the Spindle, District Lines (Politics & Prose), Midway Journal, Touch: the Journal of Healing, The Literary Nest, and Revise the Psalm: Works Celebrating the Writings of Gwendolyn Brooks. She received her MFA from the University of Maryland College Park. Three Poems by Ngozi Olivia Osuoha: "The Marathon of War," "Jungle Justice a Thorn in the Heart," and "Africa Recounts"
Ngozi Olivia Osuoha is a Nigerian poet/writer/thinker/rhymer. She has been published in journals in the UK, US, Ghana, Liberia, India, Zimbabwe, Canada, Kenya, Trinidad and Tobago and Germany among others. Two Poems by Stefanie Bennett:'The Letter" and "Women's Work: 2 Trains Running "
is published by Walleah Press. A Poem by Joan Leotta: "While Other Flowers Wait for Spring..."
Joan Leottahas been playing with words on page and stage since childhood. She's a journalist, novelist, poet and playwright. Her novels feature strong Italian-American women. Joan's poems and picture books celebrate food and family. Her poetry and essays appear in Gnarled Oak, Red Wolf, A Quiet Courage, the A-3 Review, Hobart Literary Review, Silver Birch, Postcard Poems and Prose among others, Her blog, Recipes for Success, is at www.joanleotta.wordpress.com. He Facebook page is: Joan Leotta, Author and Story Performer. Her first poetry chapbook, Languid Lusciousness with Lemon, is out this year on Finishing Line Press. Three Poems by Olfa Philo: "Flood," "Assassin," and "Denied Passion"
Olfa Philo is a writer from Tunisia and holds a PhD in American literature. She is an English teacher and an ex-international volleyball player. Her cause as a poet is to voice the buried emotions and phobias of the oppressed and the downtrodden and also to unmask and expose hidden truths socially considered as taboo or shameful. She is a female rebel at heart who wages war against injustice, marginalization, intimidation, objectification, subjugation and violence against the powerless. Her weapons are peaceful, yet bullet-like words. Her poems have appeared in different online and print literary journals in Tunsia, USA, UK, Canada, India, Asia, China, Albania and Serbia. Some of her poems have been translated into Arabic, Serbian, Chinese, Albanian and the Assamese language. She has published so far a play entitled "Sublime Revenge" and a collection of poetry entitled "(Un)jailed," both available on Amazon. Three Poems by Tamsen Grace: "Eve," "This Princess Saved Herself," and "I Am Pink"
Three Poems by Marianne Lyon: "Love Song," "Amazing Love," and "Twilight Stroll"
Three Poems by Katelin Rice: "I am Eve," "12.22.12," and "Basements"
Katelin Rice is a middle-school English teacher. Her brand of feminism was reborn with her first child and continues to evolve as she wends her way through the cornfields in her small-town home. When she's not teaching, directing middle school musicals, writing poetry, reading excellent literature, or taking care of her son, she enjoys sporting overalls, cooking, and doing yoga. Three Poems by Judy Moskowitz: "Implicit Bliss," "When I'm With You," and "Ode to Illusion"
Three Poems by Jan Ball: "Play Street for the Needy," "Suspended for Smoking," and "Upstate New York Defined"
Jan Ball started seriously writing poetry and submitting it for publication in 1998. Spouse (2011) and Chapter of Faults (2014), published by Finishing Line Press and available on Amazon. She is a member of The Poetry Club of Chicago. She is a former Franciscan nun and is married with two children. Fizza Abbas is a struggling writer and poet from Pakistan, who loves to explore the world with visionary eyes. Her work has been published in many online publications, including Best New Poems, The Legendary, Eye On Life, Express Tribune, Poetry Pacific, Health TV, and many others. Two Poems by Ellae Lawton: "Musings of a Retired Suburbanite," and "After My Daughter's Wedding"
Editor and English professor emerita Ellae Lawton has been a feminist since she discovered Queen Elizabeth I at age six but has considered motherhood her greatest privilege for nearly half a century. Born a Hoosier, she now lives near her daughter in southeastern North Carolina. Some of her work has appeared in The Dead Mule School of Southern Literature, Referential, Wild Goose Poetry Review, Iodine Poetry Journal, and When Women Waken. Daginne Aignend is a pseudonym for the Dutch poetess Inge Wesdijk. She started to write English poetry four years ago and posted some of her poems on her Facebook page and on her website. She likes hardrock music, photography and fantasy books. Daginne is a vegetarian and spends a lot of time with her animals. A Poem by Carol Ann Moon: "1969 Hasbrouck Heights: The Show Must Go On"
Carol Ann Moon is a library professor at Saint Leo University and an MFA candidate at Stetson University. Her slice-of-life poetry often features the wonderful and indomitable women in her family. I have a Ph.D. in creative writing from The University of Wisconsin-Milwaukee and am an English Professor and Director of the Graduate Program at Mount Mary University in Milwaukee, Wisconsin. For my fiction, I have received a Ragdale residency, and was a recent finalist for Glimmer Train’s Family Matters Short Story prize, the Snake Nation Press’s Serena McDonald Kennedy Award for a short-story collection, the John Gardner Memorial Fiction Prize, the Cincinnati Review’s Schiff Prose Prize, and the Crab Creek Review Fiction Prize. My work has been nominated for a Pushcart prize and has been published in journals such as Calyx, Tampa Review, Natural Bridge, The Laurel Review, Cimarron Review, Bluestem, Milwaukee Magazine, Phoebe, RE:AL, The Southern Women’s Review, Knee-Jerk, Literary Orphans, Circa Review, and elsewhere. My novel, Shame the Devil (SUNY Press), about nineteenth-century American journalist and novelist Fanny Fern, was named a finalist for Foreword Reviews 2011 Book of the Year Award for Historical Fiction. Fiction by Sneha Subramanian Kanta: "Meta-narratives"
Sneha Subramanian Kanta believes all writing is a form of dissent. Her work has forthcoming in Fallujah Magazine, 7X20 mag, In Between Hangovers Magazine, Sahitya Akademi, Noble/ Gas Qtrly, Epigraph Magazine and the print anthology of Peacock Journal. Her work has been published in poetry anthologies such as Dance of the Peacock (Hidden Brook Press, Canada), Suvarnarekha (The Poetry Society of India, India) and elsewhere. Fiction by Jennifer Holdich: "The History Channel"
I was born and grew up in the East Midlands in England and now live in South Wales. I've written for pretty much all this time and has had a few short scripts performed at venues around Cardiff. I completed an MA in Scriptwriting, but have recently returned to prose, where it all started. CNF/Essay by Carol Smallwood: "Excerpt from Midwestern Spring"
CNF/Essay by Diane Quick-Machaby: "The Hitchhikers"
Diane Quick-Machaby is a native Floridian living her entire life in North and Central Florida. She has two grown daughters and has lived in the Jacksonville area for over 28 years. After being a Stay-At-Home Mom, Room Mom, PTA Mom and Community Activist, Diane began her career working with nonprofits in Northeast Florida. Since the early 1990’s, she worked for the City of Jacksonville’s Keep Jacksonville Beautiful Programs, Habitat for Humanity in Jacksonville and St. Augustine, and Home Again St. Johns, an agency that works directly with the homeless of St. Johns County. In 2015, Diane joined her husband to start their own business, Art 4 Charities, which partners with nonprofits in their fundraising efforts.